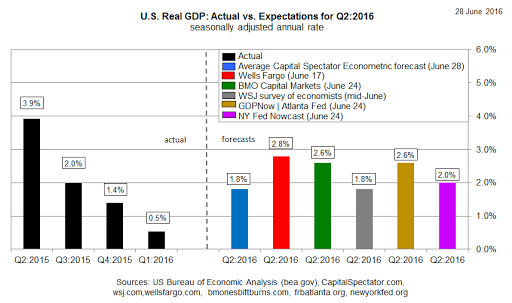 Home > economy > Will Brexit Derail U.S. GDP? Will Brexit Derail U.S. GDP? Next month’s “advance” GDP report for the US in the second quarter is widely projected to show that economic activity will rebound from Q1’s sluggish 0.8% gain (which is expected to be revised up to 1.0% in today’s revision, according to Econoday.com’s consensus forecast). But a higher level of macro uncertainty is clouding the outlook after last week’s UK vote to leave the European Union. The US may be relatively insulated from the economic effects, but not entirely, according to a new Goldman Sachs forecast. The bank trimmed its outlook for US GDP growth in this year’s second half to 2% from 2.25% previously, Reuters reports. For the moment, however, most analysts are still anticipating a moderately stronger expansion in Q2. The Wall Street Journal’s survey of economists for this month points to a 2.4% rise in GDP (seasonally adjusted annual rate) for the April-through-June period, based on the average forecast. That’s near the high end for expectations, although some analysts are looking for an even stronger rebound when the Bureau of Economic Analysis publishes the first round of Q2 GDP data on July 29. Wells Fargo’s economic team, for example, projects a 2.8% increase, according to its June 17 estimate. The latest nowcasts from two regional Fed banks are also projecting a solid bounce in Q2 growth. The Atlanta Fed’s GDPNow model sees growth at 2.6% as of June 24. The New York Fed’s June 24 estimate is lower at around 2.0%, but that’s still a decent improvement over Q1. The Capital Spectator’s projection is a bit lower, at 1.8% for Q2, based on the average projection for several econometric estimates–fractionally above last month’s average projection. Markit’s worrisome outlook finds support in the ongoing deceleration in economic growth through May, based on the three-month average of the Chicago Fed National Activity Index, which slumped to a four-year low last month. In sum, there’s wide disagreement about the outlook for Q2 GDP, and the Brexit fog isn’t helping. For now, the main impediment to deeper clarity about the second quarter is the lack of economic data for June. The next major update on that front arrives on July 8, when the Labor Department publishes this month’s employment report. Until then, the outlook for Q2 is dark—or bright, depending on the forecast.